El Tricolor is a proud and storied Mexican tradition. The Mexico national soccer team has made it into the FIFA World Cup 14 times — including this upcoming 2014 World Cup in Brazil — and it’s one of only six teams to have successfully qualified consecutively since the 1994 World Cup, which was played in the US. And although El Tri has never won, its presence has always been felt — fueled by a supremely talented pool of Mexican players, a fiercely competitive national pride and a joyous fan following. Currently ranked 19th in the FIFA World Rankings, Mexico has more to be proud of than numbers; we have a squad with internationally renowned ballers like Giovani Dos Santos, Chicharito Hernandez and Rafael Marquez. But to really appreciate what the World Cup means to Mexico and the Mexican people, we’ve got to look back at key moments in our historic run in sports’ most celebrated event. Mexico first showed on the big stage in the 1930 World Cup. It was a tough showing, grouped with Argentina, Chile and France. El Tri’s first game was in Montevideo against France and we fell 4–1. Our second World Cup game was against Chile and we fell once more (3–0) in Montevideo. Mexico’s third match, against Argentina was a slugfest (6-3), but again we lost and were ultimately eliminated. It would be two decades before Mexico would make it back to a FIFA World Cup. And once there, Mexico did not manage to break out of the first round for five consecutive World Cup appearances. In 1970, Mexico hosted the World Cup. The first game was a staunch showing that resulted in a draw against a fierce Soviet Union side. The second game was a statement for El Tri in which the Mexican side defeated El Salvador 4–0. Mexico advanced all the way to the quarter-finals but was eliminated in a 4–1 loss against Italy. Once again, El Tri failed to make it past the first round after losing to Tunisia (3-1), West Germany (6-0) and Poland (3-1). Mexico hosted the World Cup once again in 1986 this time coached by the legendary Bora Milutinović. 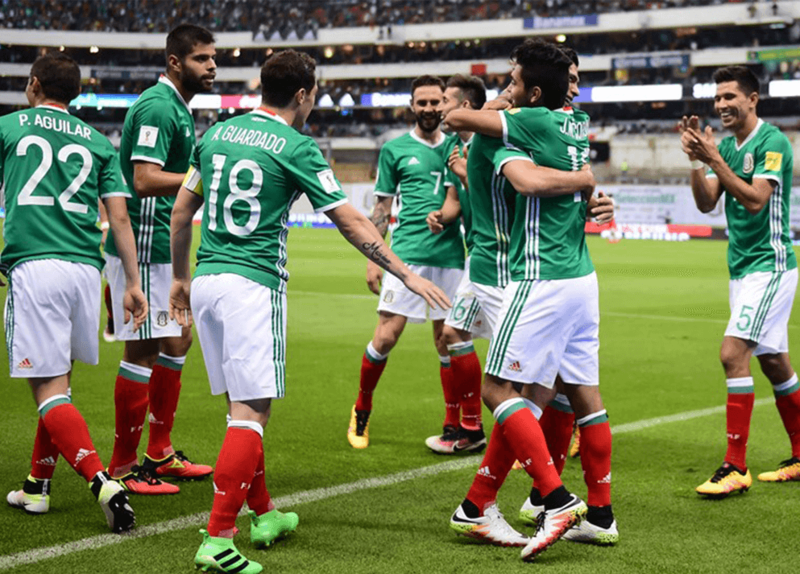 Mexico beat Belgium 2–1, tied Paraguay 1–1 and defeated Iraq 1–0, advancing to the next round. There we beat a strong Bulgaria squad 2–0 and forged ahead to the quarter-finals stage. There we lost to West Germany 4-1 in a penalty shootout after a tie in regulation. West Germany went on to lose the final against a Maradona-led Argentina 3-2. Even in the loss, El Tri showed it could hang in there with the best of them. Now a dark time for Mexico’s soccer heritage: Mexico was disqualified from the 1990 FIFA World Cup after some players in the 1989 FIFA World Youth Championship were found to be over the age limit allowed by FIFA in the qualifying round. The punishment was expected to only be applied to the youth team (not the World Cup or Olympic teams), but was eventually leveled at all Mexican national teams within FIFA tournaments. The 1994 Mexico squad featured some big names, including Jorge Campos (arguably the best goalkeeper at the time), Claudio “El Emperador” Suarez and Hugo Sanches, just to name a few. Mexico went on to win that World Cup’s “Group of death”, which included Italy, Ireland and Norway. Mexico eventually lost in the Round of 16 to Bulgaria, however, falling once more as a result of penalty kicks. In 1998, Mexico made it once more to the Round of 16 but fell to a Germany squad (2-1) that went on to the Quarter Finals. Mexico started with a 1–0 win over Croatia followed by a 2–1 win over Ecuador. Mexico then fought hard for a 1–1 draw against Italy and made it on to the Round of 16. There, we fell to CONCACAF rival USA 2–0. In 2006, Mexico kicked off its World Cup showing with a strong 3-1 win over Iran, a 0-0 draw against Angola and hard-fought 2-1 loss to Portugal. We went on to the Round of 16 where it faced an Argentine squad rife with talent. After 90 minutes of play, both sides were tied at 1-1. Eventually Argentina broke through with an overtime goal, defeating Mexico. In the first round of the 2010 World Cup, Mexico tied 1–1 against South Africa, beat France 2–0 and lost to Uruguay 1–0, advancing to the Round of 16. In the next round, we faced Argentina once more in Round of 16 (having lost four years earlier). We fell behind after a controversial (offside) goal from Argentina but would never recover. The Mexican team was eliminated with a 3-1 loss, once again for the fifth consecutive World Cup in the Round of 16. This year, we are optimistic. The field is full of excellent squads but our boys are ready and primed for a good showing. With the leadership of seasoned and talented players like Guillermo Ochoa, Marquez, Dos Santos and the incomparable Chicharito, there’s no telling how far we can go… Let’s hope past the Round of 16. How do you think we’ll fare against the World this time around? Share your thoughts in the comments section below. MEXICO IS THE VERY BEST. BETTER THAN PORTUGAL!!!!!!!!!!!!!!! !